After our well received return to Falcon Ridge last year, I am even more excited for 2017. 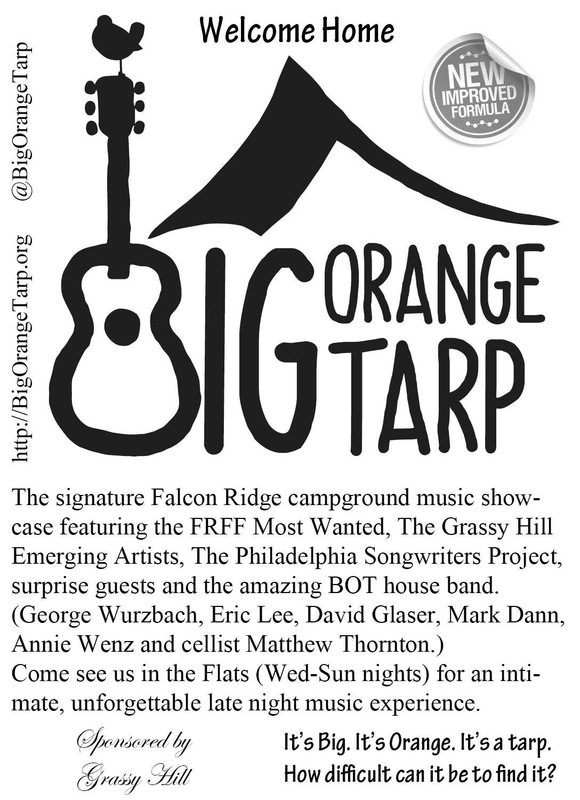 I’m delighted to report that Grassy Hill is again the official sponsor of the Big Orange Tarp. I am so grateful for their support and the invaluable assistance of the entire BOT team including Sally Johnson, Jeff Miller, Sandie Reilly, Scott and Paula Moore. With the exception of our cellist extraordinaire, Dirje Childs, who has other obligations this August, the entire BOT house band is returning: George Wurzbach (keyboards), Eric Lee (Violin, Mandolin, Guitar), Mark Dann (Bass) and David Glaser (Guitar, anything with strings). I’m pumped that Annie Wenz will be joining us on Percussion this year. I just added cellist Matthew Thornton. As always, I’m sure there will be surprise guests as well. The Tarp features music every night from Wednesday thru Sunday night. On Wednesday and Sunday we start around dusk. 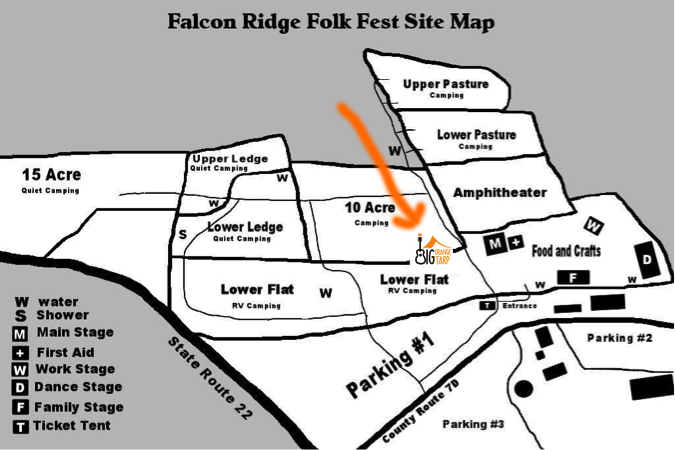 On Friday and Saturday nights we begin after the MainStage ends and our feature program consists primarily of Artists from the Falcon Ridge Most Wanted and the Grassy Hill Emerging Songwriter Showcase, sprinkled with a handful of mainstage artists and other special guests. On Thursday night, we start up when the Lounge Stage ends. Our Thursday feature this year will include the Most Wanted artists and a group rom the 2017 Philadelphia Songwriters Project contest, as well as special guests. We do an Open Circle every night after our feature rounds, where anyone is welcome to sit with us and share their songs. We encourage everyone to stop by and participate or listen.Unlike some of the other camp music sites, I never publish a full, timed schedule ahead of the festival because our format is very organic. I program the strongest music I can find and we try to avoid dead air as much as possible. Come sit with us, you won’t be disappointed. This year’s Most Wanted artists are Bettman & Halpin, Kirsten Maxwell, and Kipyn Martin. This year’s Grassy Hill Emerging Artist Showcase includes: Alice Howe, Aly Tadros, Bruce Michael Miller, Caroline Cotter, Christine Sweeney, Clint Alphin, Emily Mure, Frances Luke Accord, Hadley Kennary, Heather Aubrey Lloyd, Izzy Heltai, James Hearne, John John Brown, Josh Harty, Letitia VanSant, Lisa Bastoni, Monica Rizzio, No Good Sister, Ordinary Elephant, Renee Wahl, Robinson Treacher, Ryanhood, Shawn Taylor, The End Of America. 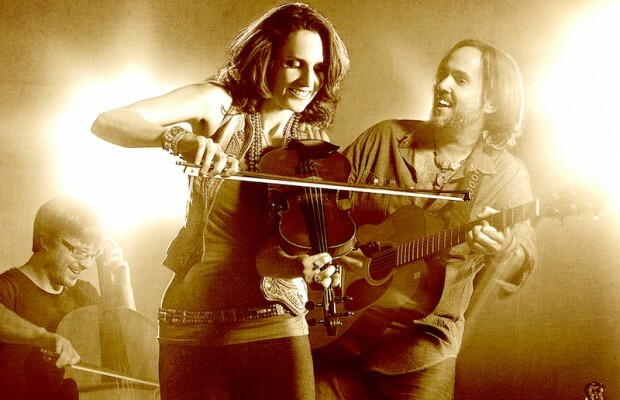 Ambassadors from the Philadelphia Songwriters Project include The Whispering Tree, Emily Drinker, and John Sonntag. Rod Macdonald, Annie Wenz, and several other mainstage artists will join us during the festival.